Matthiola (/ˌmæθiˈoʊlə/, syn. Mathiola R.Br. ), is a genus of flowering plants in the mustard family. It was named after Pietro Andrea Mattioli. This genus contains about 48 to 50 species of annual, biennial and perennial herbaceous plants and subshrubs. Many are cultivated for their heavily scented, colorful flowers. 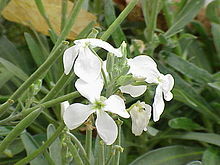 The common name stock may be applied to the whole genus, more specifically to varieties and cultivars of Matthiola incana. 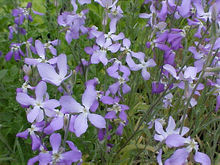 The common names evening stock and night-scented stock are applied to varieties of Matthiola longipetala (syn. M. bicornis). 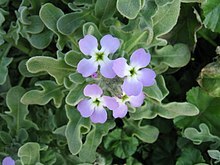 The common name Virginia stock refers to a separate genus of the same family (Malcolmia maritima). ^ Sunset Western Garden Book. 1995. 606–07. ^ Jaén-Molina, R., et al. (2009). 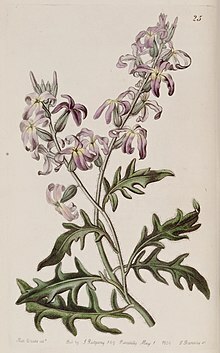 The molecular phylogeny of Matthiola R. Br. (Brassicaceae) inferred from ITS sequences, with special emphasis on the Macaronesian endemics. Archived 2014-02-28 at the Wayback Machine Molecular Phylogenetics and Evolution 53(3) 972-81. ^ Matthiola. Flora of China. ^ Sanchez, J. L., et al. (2005). Genetic differentiation of three species of Matthiola (Brassicaceae) in the Sicilian insular system. Archived 2014-02-28 at the Wayback Machine Plant Systematics and Evolution 253(1-4) 81-93. ^ Dirmenci, Tuncay; Satil, Fatih; Tümen, Gülendam (2006). 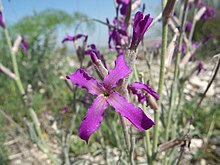 "A new species of Matthiola R. Br. (Brassicaceae) from Turkey". Botanical Journal of the Linnean Society. 151 (3): 431–435. doi:10.1111/j.1095-8339.2006.00518.x. 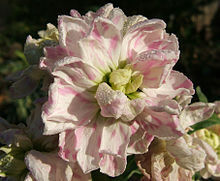 Wikimedia Commons has media related to Matthiola. 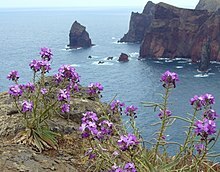 Matthiola. USDA Germplasm Resources Information Network (GRIN). This page was last edited on 25 January 2019, at 03:29 (UTC).